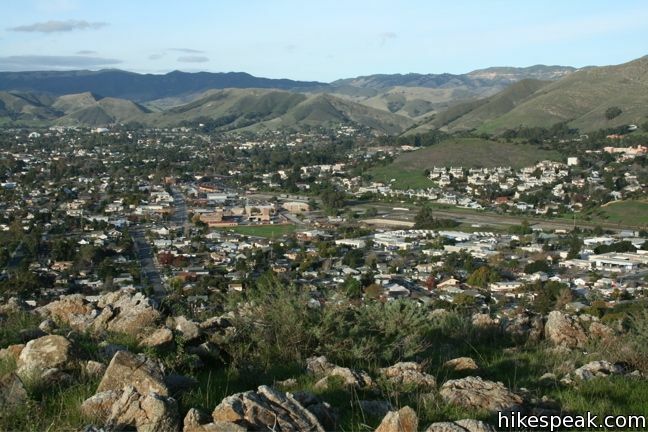 While shorter than the more celebrated peaks around San Luis Obispo (those attention-seeking Morros known as the Nine Sisters), the 580-foot summit of the South Hills provides excellent easy-to-reach views of San Luis Obispo. 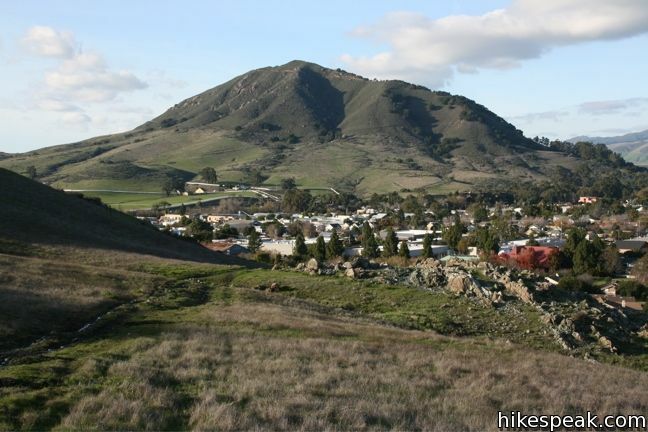 A perimeter loop trail tours the 133-acre South Hills Open Space, along with a ridge trail that provides a 1.5-mile round trip hike as it ascends 450 feet to the top of the green space just south of downtown San Luis Obispo. 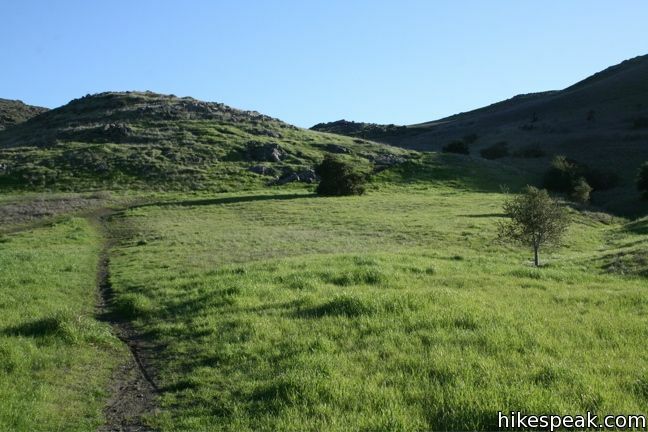 South Hills Open Space has a few access points. 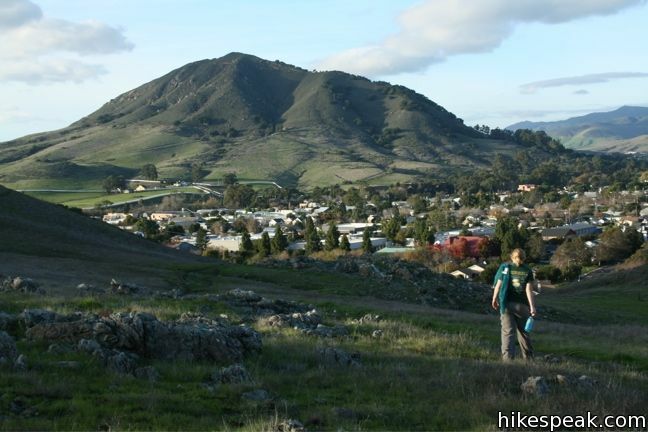 The Ridge Trail hike begins from the Woodridge Trailhead, 0.2 miles south of South Street on Exposition Drive. 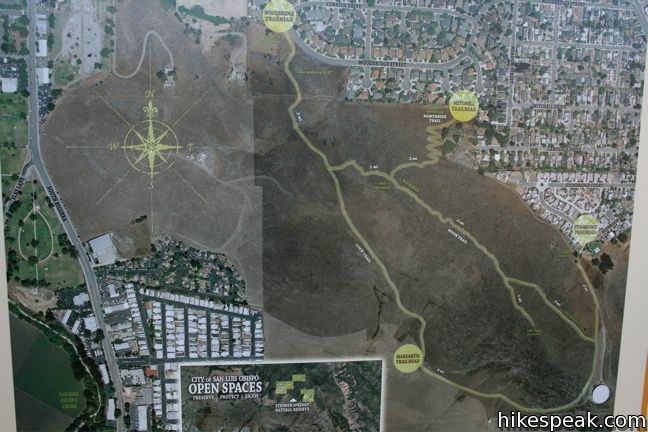 Large signs at the trailhead describe the plants and animals living in South Hills Open Space, along with an aerial map of the trail. 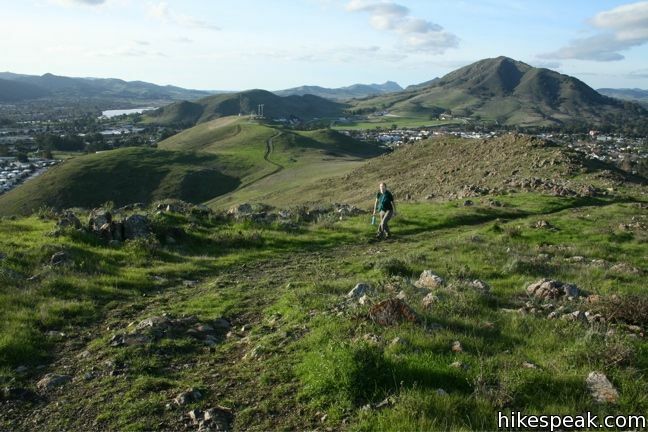 Begin hiking south up the dirt single track along the left side of a draw in the hillside. 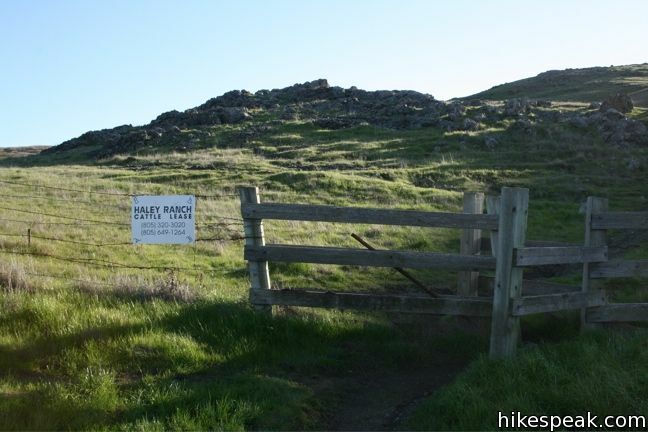 After 1/8 of a mile, pass through a cattle gate crossing the trail. Just before the gate, a footpath to the left goes to a low overlook. 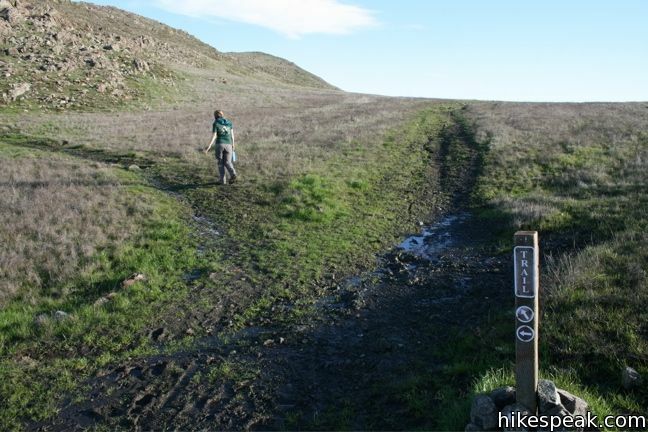 Continue up the grassy slope for another 1/8 of a mile to a marked junction at a saddle in the ridgeline. 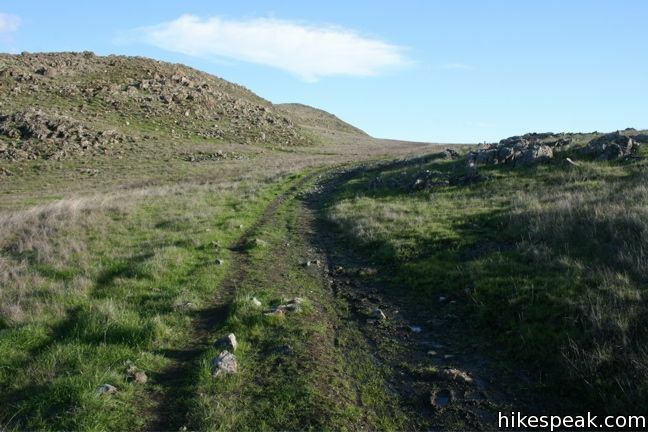 Turn left toward the rocky slope leading up to the high point of the park. Straight ahead, the Loop Trail continues a short distance to a meeting with a dirt road heading uphill to the right to a collection of transceiver towers. The trail heads in the other direction as well, down around the hill to a few other trailheads. 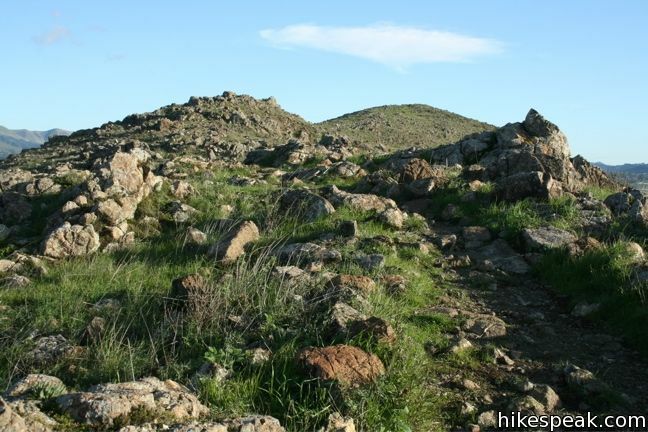 Left of the junction, the single track crosses the saddle and meets the rocky ridge. 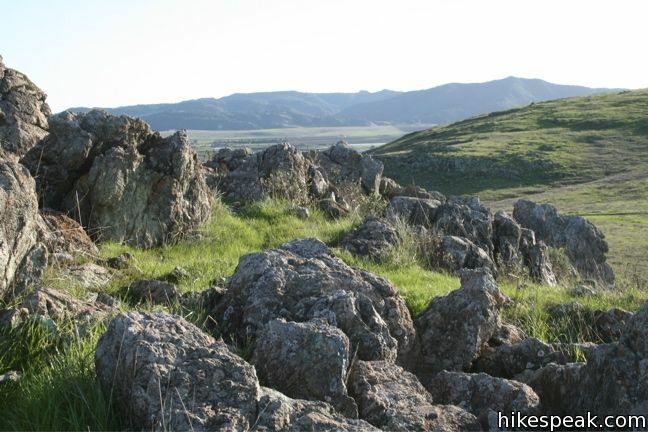 The trail angles to the right, southeast, up through the rock formations, becoming faint in places as it tackles a slope of blue-gray boulders circled by brushgrass. 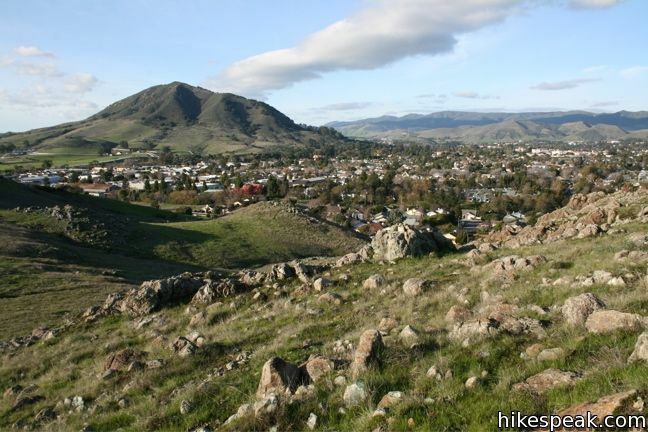 The views become progressively more panoramic as you climb. 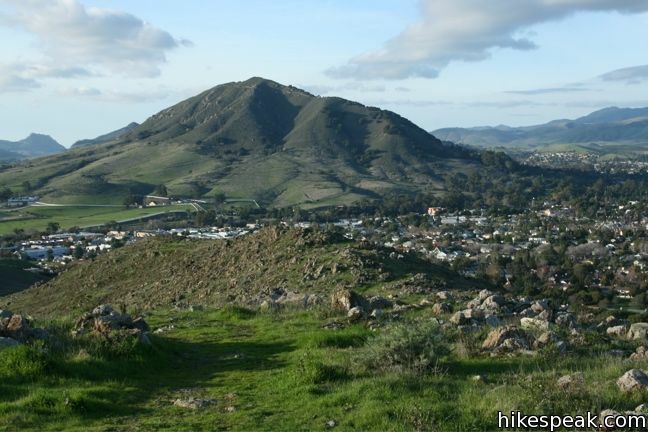 North of the city rises Cerro San Luis (or San Luis Mountain) and behind that is Bishop Peak. 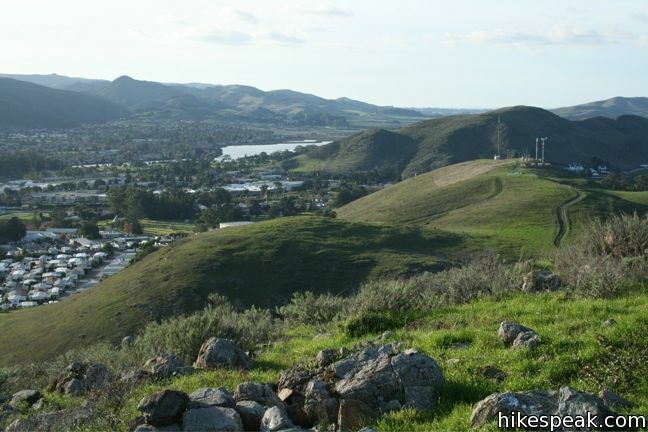 Laguna Lake and the Irish Hills are in sight to the west, and the Santa Lucia Mountains can be seen to the east and south, framing the Edna Valley. 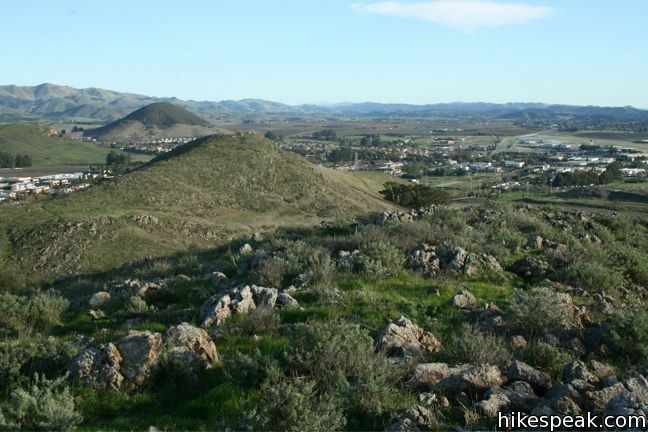 Eventually, the easternmost Morro, Islay Hill, becomes visible as well. 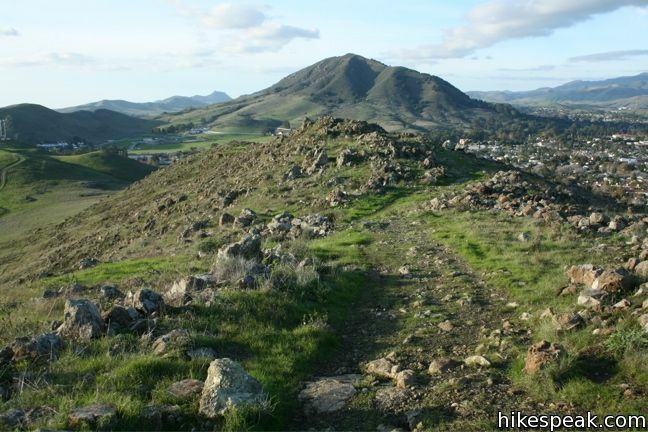 The craggy rocks on the windswept slopes of the South Hills create a picturesque foreground for hikers on this trail. 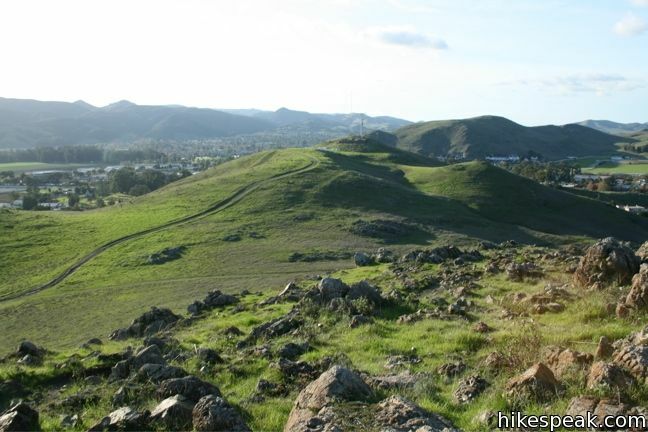 Few plant species can grow in the serpentine soil covering the South Hills. The grasses and wildflowers that are able to grow here are uniquely suited for the tough environment, and thrive absent the competition of gamier species. The grassy tree-less terrain provides open views of the surrounding city and peaks. 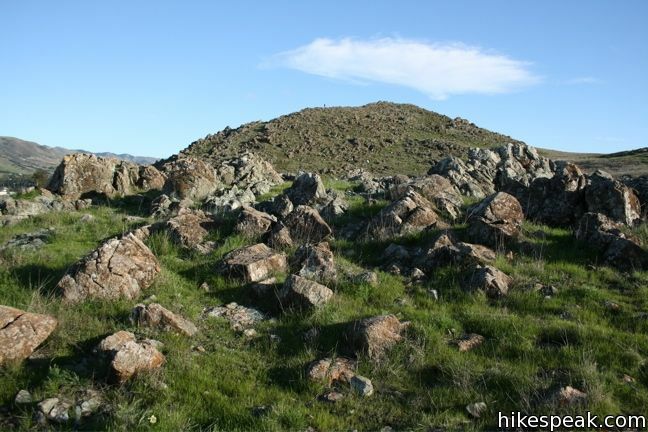 A quarter mile from the junction is a false summit. 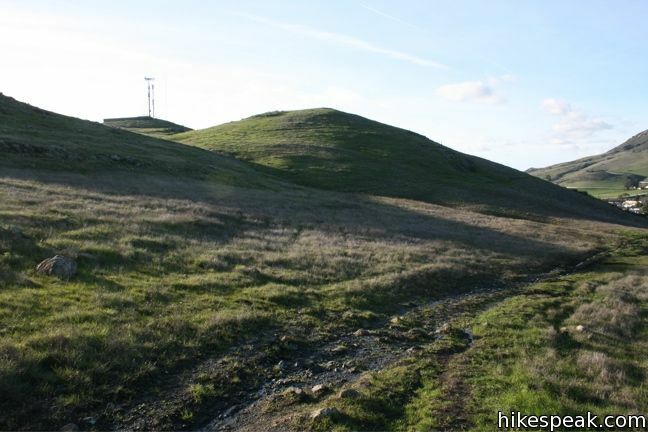 Fortunately, the trail continues along the ridge for another quarter mile to an even higher point at the top of the South Hills. 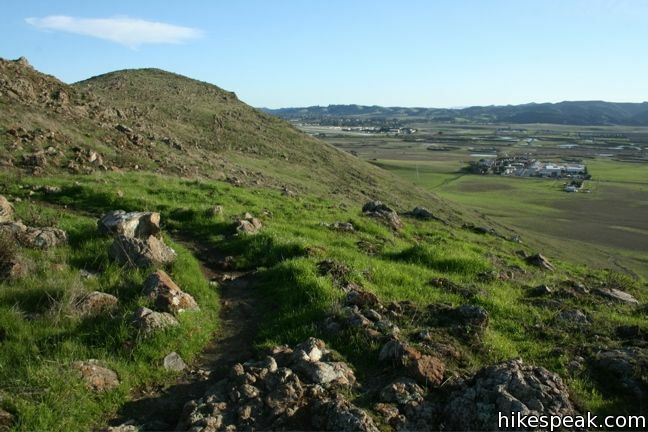 The grassy summit provides sweeping 360-degree views. Take in the impressive sights before returning the way your came. 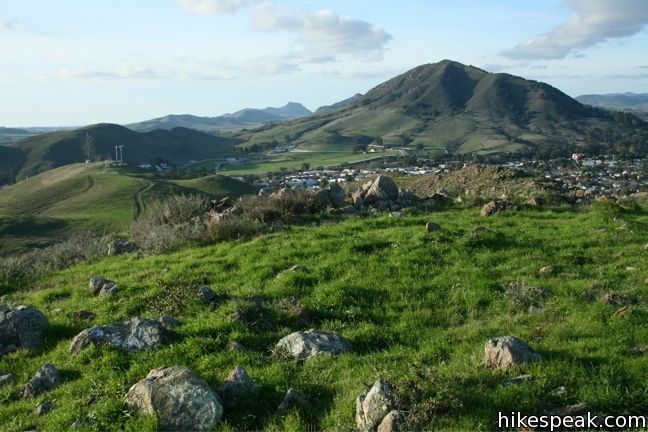 This 1.5-mile hike to the 580-foot top of the South Hills is a brief and enjoyable excursion just blocks from downtown San Luis Obispo. Dogs are welcome on the trail, and no fee or permit is required, so get out and enjoy. 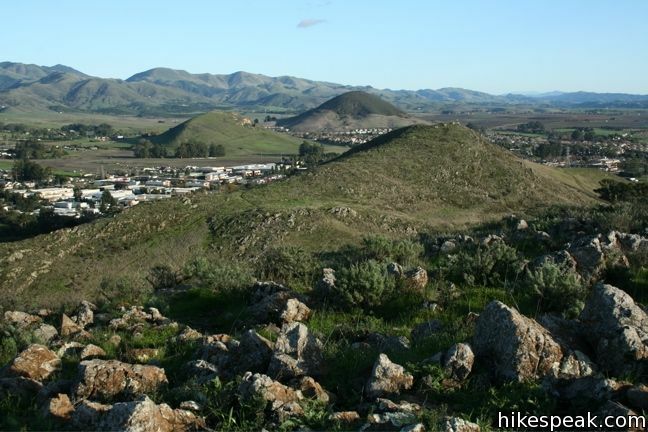 To get to the trailhead: From Highway 101, exit on Madonna Road and head northeast for 1/4 of a mile to Higuera Street. Turn left and continue north for one black to South Street and turn right. Make the second right on to Exposition Drive after 1/3 of a mile. Continue a quarter mile to the Woodridge Trailhead on the right, just after an intersection with Corrida Drive where Exposition Drive becomes Woodbridge Street. Roadside parking is available. These photos were taken in December of 2010. Click to enlarge. 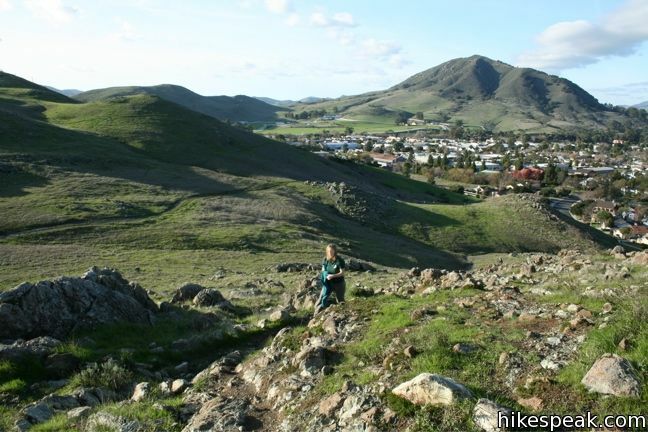 This 5.7-mile hike ascends to the summit from a nearby park. There is another trailhead to access this trail at 2695 Meadow St. 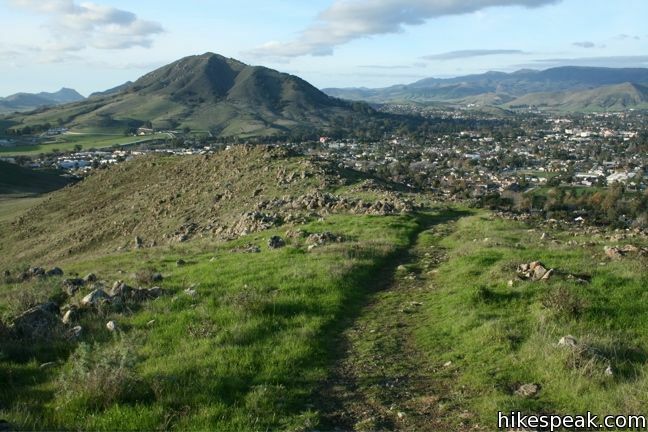 This is called the Northside Trail access to the South Hills Open Space. It can be reached by walking down the extension of Mitchell Rd that is signed “private drive”. 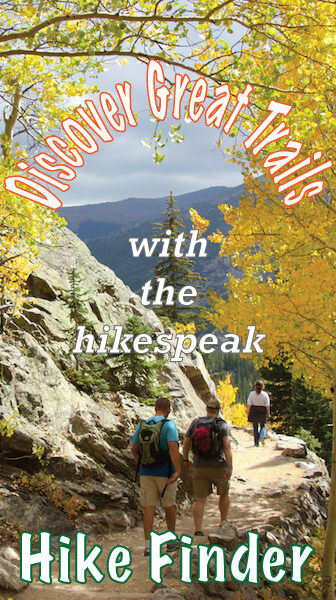 You will see a trail sign as you walk part way down.